It is Saturday and yes, I am going to the Escape at least for a little while. It wasn’t till 4 that I thought I could go so I am looking forward to it. I have a lot going on right now so it is harder to plan my Susan time. In a way I think you realize how special that time is when you have to plan a little more to work it out. Susan really is an important part of who I am and it is hard when you can’t express your true self. Any way I started getting ready a little after 4 as I wanted to get to the Escape early. Kate had texted me she would be there so I was looking forward to seeing her as she has not been out for 6+ weeks. Now I took my time on my makeup and tonight I really liked the way my eyes turned out, I wish I had taken a picture just of my eyes. 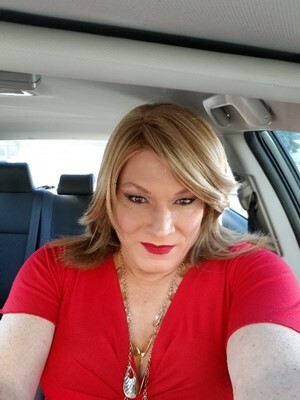 I was done with my makeup and was deciding on my dress, I went with my red one. Now the big choice should I wear my corset. It has been hot the last few weeks and the next 5 days will be in the mid 90’s which around here is really hot but today it is only in the low 80’s so I decided I would wear it and hope I was not to hot. I got it on and I really like the way it looks as it does give me a nice shape, it takes my waist in about 5 inches and the shape of it increases my hips a couple inches so with it on my waist is about 6 inches smaller then my hips and bust, I actually have an hourglass shape with it. The other thing great about it is it makes me sit up straight, I really slouch a lot and I really don’t like it when I do it but I never really think about it unless someone points it out to me, a bad habit. The corset fixes that as it is impossible to slouch in a corset. I was al ready and on my way about 5:45 and got to the Escape at 6 and went in. Kate was already there so we would get a good chance to talk as we waited for others to show up. I ordered dinner, yes it was a hamburger as I really like their burgers here and it is the first 1 I have had this week. I have been trying to watch what I eat and have cut down on my dairy, Milk, I love milk so it has been hard. I use to drink 2 gallons or more a week not it is less then a gallon and it actually helps. I have lost almost 10 LB’s in the last 3 weeks or so. It didn’t take long for my burger as they really were not busy right now, I had my choice of several parking spots right in front of the door. A quick selfie in the car before going in. Kate and I talked as I ate it was nice to catch up with her. She has been traveling a lot for work and is also dealing with some of the same family issues I am so we talked about that also. We also talked about how we get ready, what we do first and how we do it. I do my makeup first before I put on any of my girl stuff. Kate was talking how it took her a little longer tonight as she has not been able t be Kate for several weeks and it is true, if you go a while without doing makeup it is a little slower. Now I can get ready in 45 minutes if I have to and everything goes right but I really like to allow 1 ½ hours to get ready, not so much I need it but I want to take my time and enjoy it. Kate and I were both talking about it and we both enjoy the time we spend getting ready and doing our makeup. I really don’t know why other then in my male life there really is nothing to think about, shower, shave, brush my teeth and hair and put my clothes on and for my clothes they are all pretty much the same, pants and a shirt, maybe different colors but all the same. So many more options for Susan. The other night we were talking about our cruise and the formal night and if you think about it for men what is a formal night? A tux or suit, yes there are some small variations of style and color, but for woman it is wide open, so many more options even doing different hair styles. Men never do a different hair style for one night. It was amazing how fast the night went and soon it was 9, Kate wanted to go check out a place that has some Jazz bands and see which one was there, I stayed at the Escape in case any other girls showed up and sure enough right after Kate left another girl showed up. Now the funny thing is when I put on my corset earlier I was worried about being to hot and that defiantly was nit the case tonight as they had the AC cranked up. I actually got so cold I went outside for about 10 minutes to warm up. Now that is saying a lot as I am usually the last one to get cold, if Cassandra had been here tonight she would have been freezing. I came back in and they were doing Karaoke and it is fun to listen to but hard to talk any more. Jan and Lynn also showed up so I got to talk with them a little between songs. Well once again it got to me and outside I went again to get warm. I was talking with one of the lady’s ho works here in the Kitchen and she told me their AC broke yesterday and it was so hot inside so today they got it fix and boy did they get it fixed. I went back inside and sat and talked with Jan & Lynn some more. It was about 10 and Lauri showed up, it was good to see her again so we talked a little more. Again, I was freezing so I went and paid my bill and was going to call it a night but Lauri had put her name into sing. Now of course when she put it in it was not that busy but by now it was getting busy. II told her how cold I was and she admitted it was cold in here tonight also so she said I should go outside and warm up, I laughed and told her I had already done that twice so why not a third time. We went outside and it was still warmer then inside and my cell phone said it was 68 out now. We were talking and Rachel showed up, she is a GG we met years ago at the P-club and after our issue with them she got our group to go to the Sweet home, Bar & Grill. I haven’t been there for a long time as it is hard to get out on Friday nights now but I really do need to go there again as it was a wonderful place. Any way she is a wonderful lady and it was great to see her again. Her wife Heather was also her and it was great to see her also, these really are two special ladies. Well we went back inside and I listened to Lauri sing and she did great and I talked with Rachel for a while, it was great to reconnect with them but again I was getting cold and that was all I could handle so I called it a night. I said my goodbyes to everyone and left right around 11pm. Now I got in my car and yes, I turned the heat on to 76, I have not had the heat on in my car for months and I left it on all the way home. Wow it was cold there tonight. One of the bad things about being female I guess as the clothes are thinner and bare legs and arms and of course open toed heels but still worth it, and it was a great night. Thanks for reading and be sure and read my newest blog to see what’s new.